Evernote and Evernote Business are online organizational tools designed for notetaking. 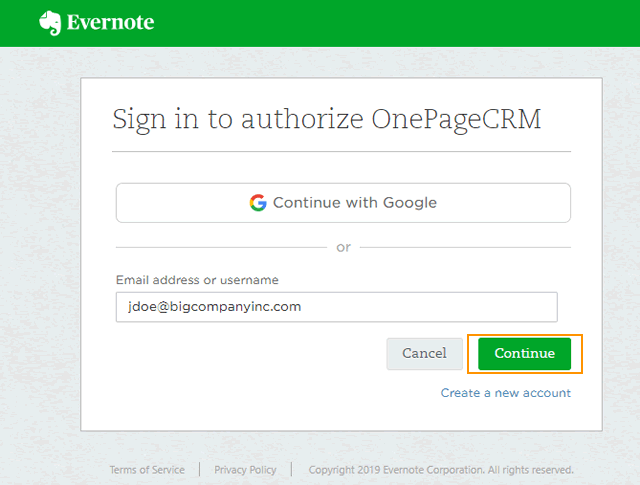 Connect OnePageCRM with your Evernote account and allow OnePageCRM to view and save notes from your notebooks, notes and tags. 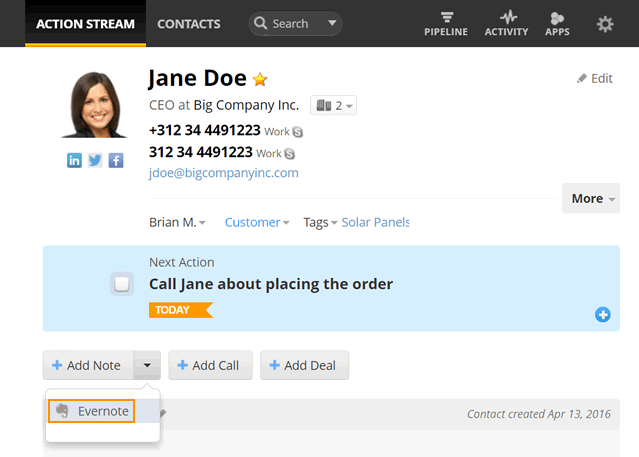 All saved notes are stored in the Notes & Calls section of the contact's timeline in OnePageCRM. 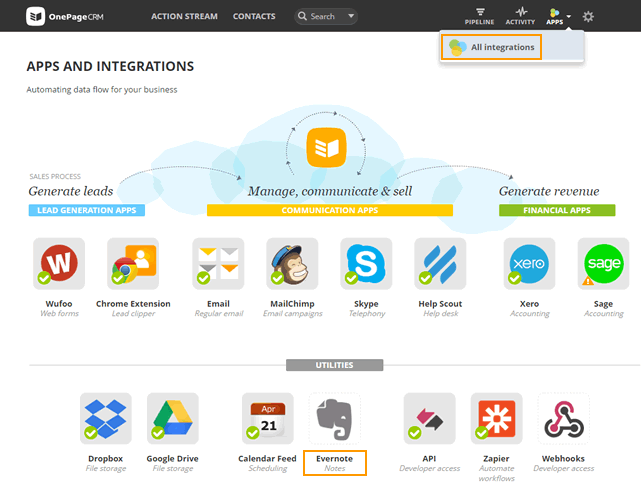 Go to Apps → All Integrations → Click on the Evernote logo under the Utilities category. Click Connect to Evernote to enable this integration. 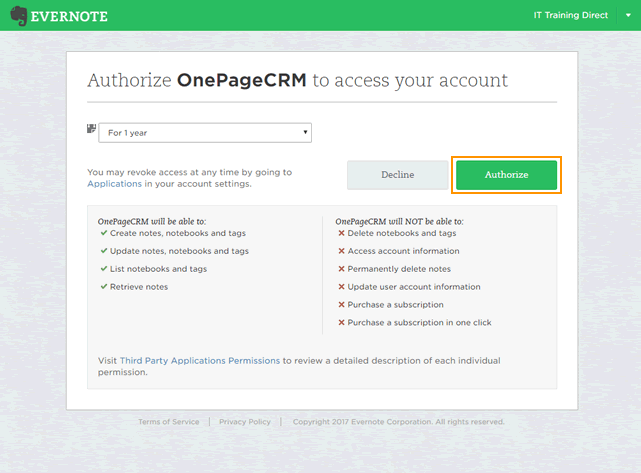 Once this integration is connected, you are brought to Evernote → sign in to authorize OnePageCRM by clicking Continue. Note: Create a new account if you don't already have one. 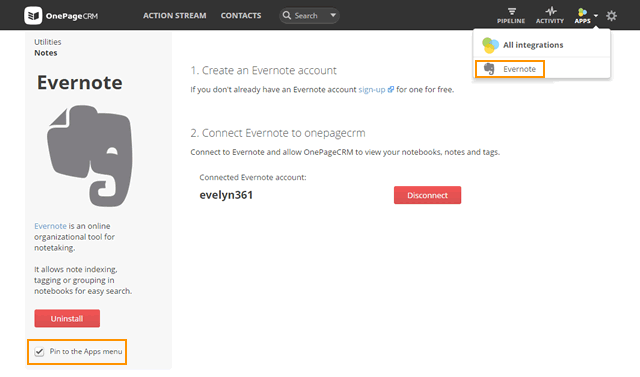 Once signed in to your Evernote account, click Authorize to allow OnePageCRM to view your notebooks, notes and tags. Note: Once successfully connected, you will receive a confirmation email from Evernote. Open a contact to which you want to assign notes from Evernote. Click Add Note and select Evernote. Enter a keyword in the search field to find specific notes. Click on a specific Evernote Notebooks or Tags to filter your notes. 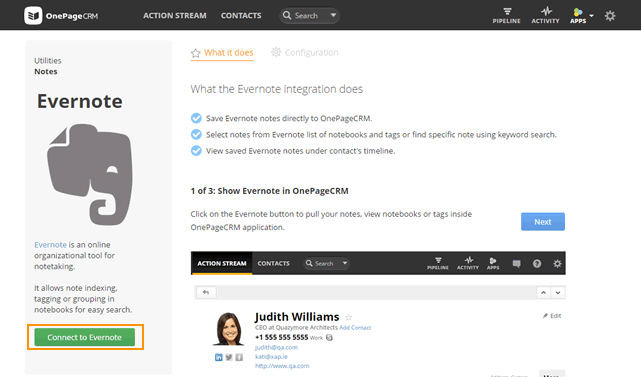 To save notes from Evernote in OnePageCRM, click on a single note or multiple notes and click Save. In Contact view under Notes & Calls you can view your Evernote attachments by clicking on the View in Evernote link or delete these notes by clicking on the bin icon. To pin the Evernote integration to the Apps menu, select the check-box: Pin to the Apps menu. You cannot save notes in OnePageCRM from notes which have been shared with you in Evernote Business. How to add a note to a contact?